It wasn’t always this way. There was a time when James Ernest’s title parodied a certain well-known secret agent with a penchant for shaken martinis and Walther PPKs. Following unflattered interest from MGM Studios’ legal department the game was totally renamed James Ernest’s Totally Renamed Spy Game. Now in the era of Kickstarter, Cheapass Games has restored it to its (partial) former glory as Before I Kill You, Mister Spy. The object is to be the first to hit or surpass 33 points. Two to six supervillains fed up with current world affairs are poised to wreak havoc with the major powers of the Earth. Of course spies have been dispatched to stop them, but per union guidelines have gotten themselves taken prisoner. Only these worthwhile adversaries could hope to understand what a megavillain goes through, so players take this opportunity to confide their genius to their captives when they ought to be disposing of them. Players want a Lair strong enough to hold these hypercompetent individuals, wherein they can be killed at one’s leisure – but not before the captive hears a monologue about one’s plans. Villains take one action per turn: They play a Spy or a Lair, or they steal a Spy or a Lair. 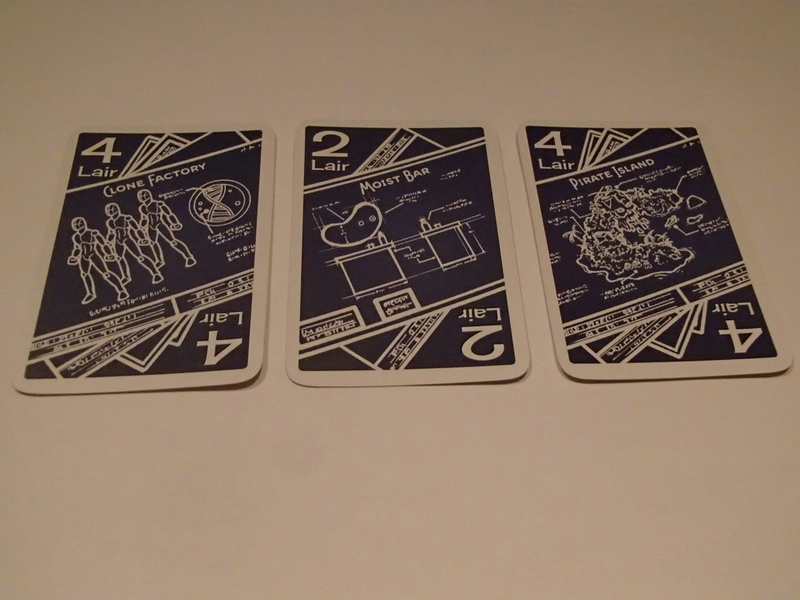 Both types of card are numbered, with facedown Lairs worth one point each until flipped to reveal their true value. A Spy can only be captured in a Lair intricate and devious enough to accommodate them – in other words a Spy worth 5 points can’t be contained by a Lair totaling less than 5. If the Lair can hold him the bad guy may collect and kill his temporary guest. There’s a special kind of Lair card called a taunt, however, that represents your attempts to (ahem) bond with your charge before liquidating him. "...or I shall Taunt you a second time"
Taunts are lettered A through I, with two copies of each letter, and using one doubles a Spy’s value. As moviegoers know, goading a Spy merely affords him the opportunity to escape – if another player has the matching-letter Taunt card he can play it and his competitor’s target frees himself to the discard pile, leaving him with no points. If no one can, or chooses to, cancel the execution, the scoundrel can prolong the torment by playing another Taunt, doubling the character’s value again. This, however, gives everyone another chance to play a match and the agent to elude an amusing demise. 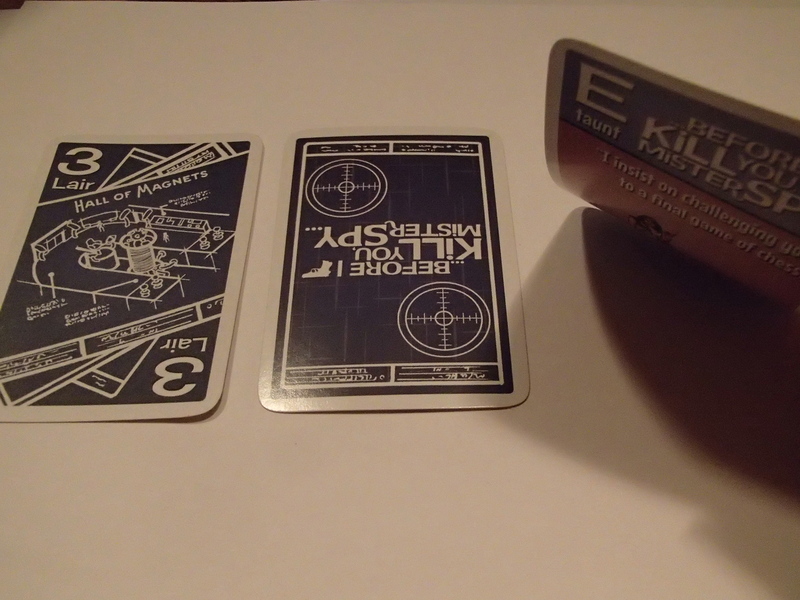 Spy and Lair cards have different backs so spies can be claimed from atop the draw deck or thieved from an opponent’s hand, then used against the others. Lair cards can also be stolen with spies (how one steals another man’s wet bar is left very much up in the air), and this is where secrecy may save one’s home base. A Spy card at least equal to a Lair card snatches it from its erstwhile owner, changing their totals. Facedown Lairs are unpredictable. If the Spy is higher or lower than the target card the agent may resign in disgust or be captured, and Taunts have the same backs as Lair cards for a reason: A facedown Taunt is a deathtrap waiting for some interloper to steal it. When someone acquires 33 points, that supervillain has taken over the world and presumably has a Spy’s head on a pike outside his Lair to symbolize it. "It's a tra...aw, you know"
From the first to the second to the third iteration of this game, the deck went from 55 cards to 110 and back down to 55. They’re bright and colorful cards with sharp, excellent renditions of various counterintelligence personnel and terrifically amusing quotes on the Taunt cards (to be read aloud, naturally). 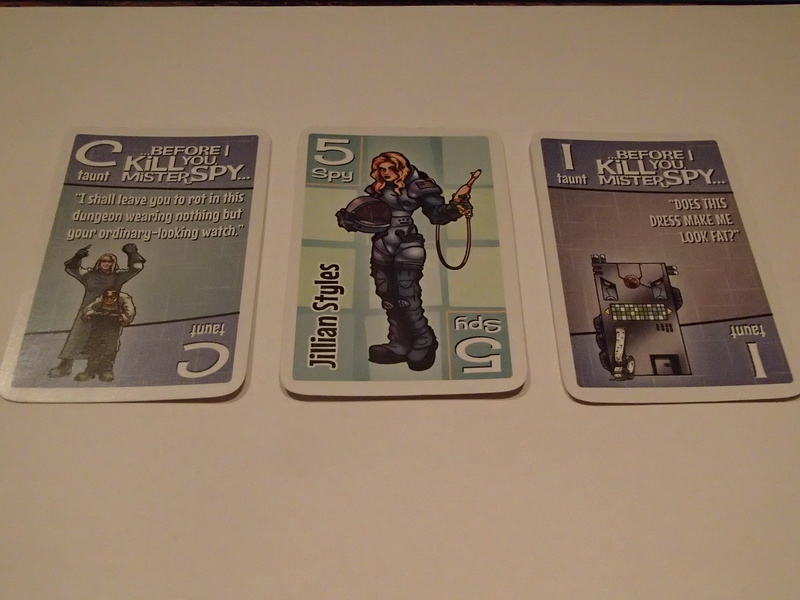 Lair components are worth a giggle as well, and the people pictured even have spy-sounding names. The fronts and backs of cards, Lairs particularly, look too much alike, making it harder to a) orient the cards when putting the game away and b) see whether a Lair is facedown or revealed. The numeral is the giveaway but a little more graphic attention would have served play better and eliminated countless double-takes. Since the trope is endless the joke remains funny and current, so the game hasn’t lost any of its charm. Before I Kill You, Mister Spy doesn’t work well as a two-player; much of the tension is lost and it all feels very much “by the numbers,” like a simple linear progression that’s more hopscotch than strategic. More players means more theft of Lairs and Spies to cripple those in the lead, and players challenge each other differently depending on whether they think they have victory in their grasp. The game is pretty good at allowing those at the back to make sudden inroads with Taunts that put them on top, so there’s a strong and welcome unpredictability factor. "Clone Factory, Moist Bar, Pirate Island..." "Wait, what was the second thing?" Gone are the bombs, if you’ve played previous versions, and in their place is a streamlined version of the game. If the group is looking for something short, this is certainly it. A game takes as little as five minutes, though for some it might be too brief. Part of the fun is the “engine building,” gearing a Lair toward some of those bigger, better Spy executions, but you just don’t get to a lot of them before someone hits 33. 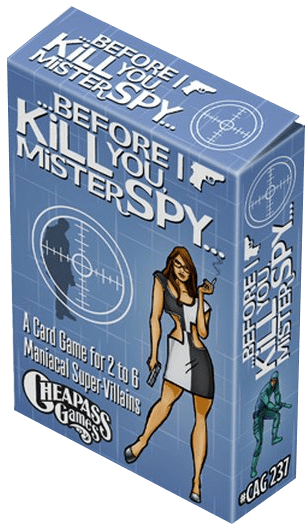 Before I Kill You, Mister Spy is a nifty romp and an excellent use of idiom, and though the game – and its victims – may be short-lived, the fun it provides is not. Sheer elegance in its simplicity, no?